With so much in common between these MacBooks, this is a hard decision for most. Let's break them down into the categories that really matter, starting with portability. 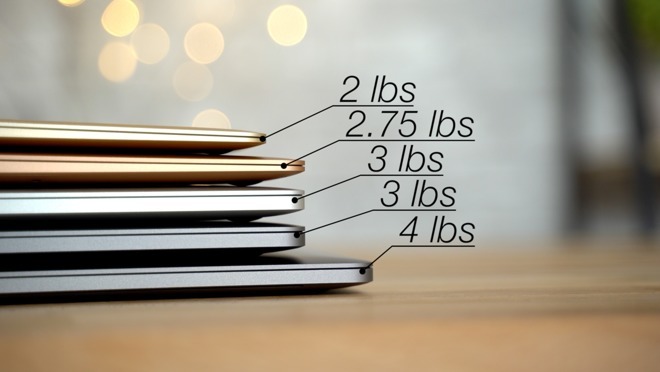 The 12-inch MacBook is by far the thinnest and lightest of them all, weighing in at only 2 pounds compared to 2.75 pounds for the Air, 3 pounds for the 13-inch MacBook Pro and 4 pounds for the 15-inch MacBook Pro. As for the MacBook Air, it's basically as large as the 13-inch MacBook Pro, so portability should be essentially identical, other than being a quarter of a pound lighter. 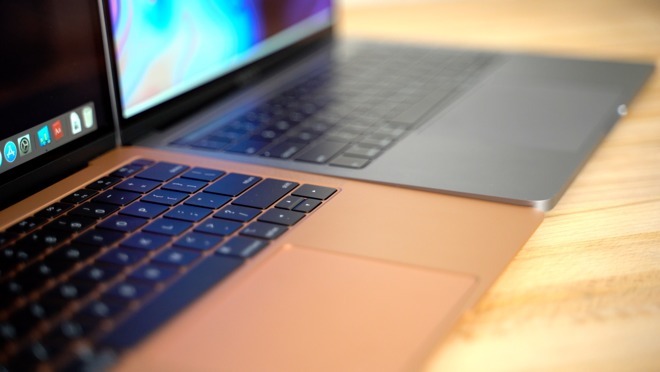 From a geometry standpoint, the MacBook Pros and MacBook are flat. 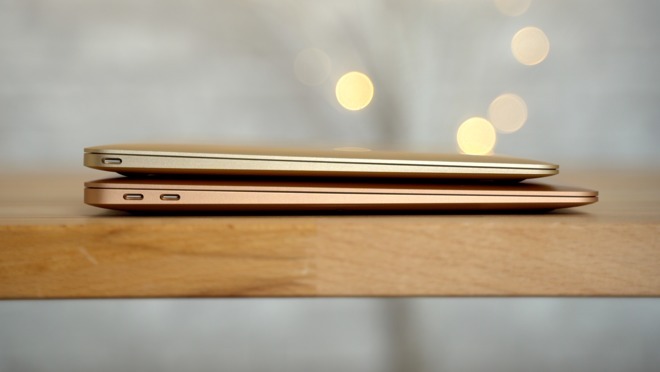 The MacBook Air, which retains the a wedge design that is thinner near the front end, but thicker than both the MacBook Pro and MacBook at its thickest point. Every single one of Apple's portables has a high-quality Retina resolution display, but there are some differences that you should know about. Even though the new 2018 MacBook Air is the newest, it actually has the worst display of the trio of models. It has the least color accurate and is the dimmest display —but still better than inexpensive Windows alternatives. 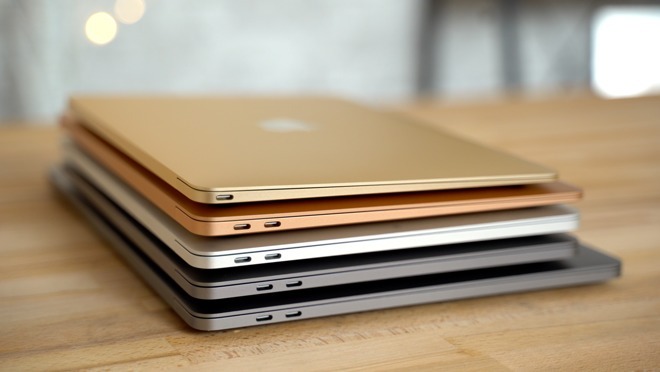 The 12-inch MacBook's display is brighter and it supports a wider range of colors. Now if you really care about the display, the MacBook Pro features 500 nits of brightness and P3 wide-color gamut support. This is a big deal if you use your laptop outside or you want to minimize bright reflections on the screen. 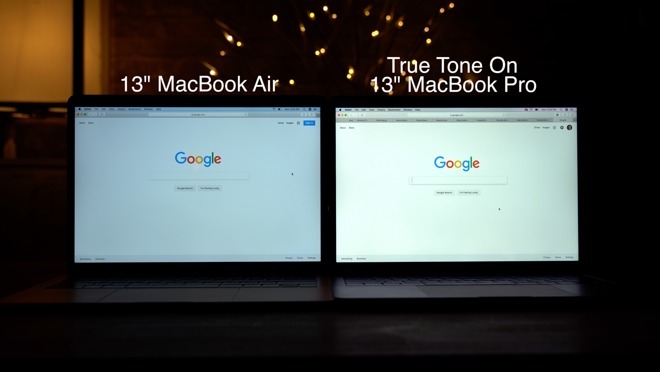 Showing True Tone on the 13-inch MacBook Pro. On top of that, the Touch Bar MacBook Pro also has True Tone, a feature that adjusts the color balance of the display to match your environment. The utility of this is a matter of opinion, and is worth checking out for yourself. The 12-inch MacBook offers the quietest speakers with the least amount of bass as you'd expect, given the limited internal volume of the device. Volume and bass increases some on the 13-inch MacBook Air. Going to the 13-inch MacBook Pro, everything gets better. The volume increases significantly, the bass is deeper and punchier, and the highs become very crisp and clear. The 15-inch MacBook Pro gets even louder speakers with more bass and a well rounded sound. Now onto the keyboards, they're all packing Apple's butterfly keys, but the new 13-inch MacBook Air and the 2018 Touch Bar MacBook Pro features the third-generation mechanisms, which include a silicon barrier beneath the keyboard that's Apple says is to make it a quieter typing experience. The effect of the membrane on reliability is yet to be determined. While there has been a lot of noise about the keyboard failures, the actual failure rate is pretty low, and even lower on the 2017 MacBook Pro than on the 2016 MacBook Pro. The extra peace of mind that the membrane may generate is nice to have, and it does in fact makes the keyboard quieter as Apple promised as well. Apart from that, the MacBook Air that features a wedge shape design is a little bit more comfortable to type on since the keyboard slopes downward towards the front edge. But, this is an incredibly personal thing, and worth spending some time on all of the keyboards to suss out for yourself. 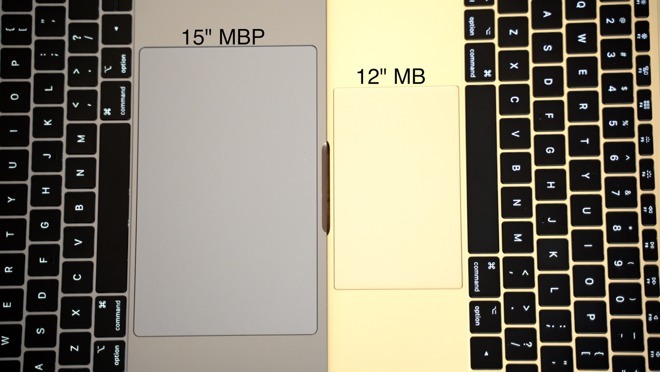 If you love large trackpads, the 15-inch Pro has the biggest, and the 12-inch MacBook obviously has the smallest. The 13-inch MacBook Air has a considerably smaller trackpad than the 13-inch MacBook Pro, which is interesting because the machines themselves are basically the same size. The 2018 MacBook Pros also come with the Touch Bar, giving you interactive and customizable buttons, along with a Touch ID sensor for logging in and using Apple Pay. The new MacBook Air also gets the Touch ID sensor even though it's missing the Touch Bar —that's a nice plus for that model, considering it's the cheapest. Models with Touch ID also come with Apple's T2 security chip. We've spoken at some length about what the T2 does for you, and some restrictions that it can apply in the interest of security. The 12-inch MacBook only gets a single USB 3.1 type C port, so if you want to charge and transfer data at the same time, you'll have to buy a hub. Given the USB-only nature of the port, you're limited to only 5 gigabits per second transfer speed instead of 40 on the rest of Apple's portable line that all have USB-C Thunderbolt 3 ports. The MacBook Air and the 13-inch MacBook Pro with Function Keys both get two Thunderbolt 3 ports. Both of the 2018 Touch Bar MacBook Pro sizes get four, so they're the best options if you own a lot of peripherals. 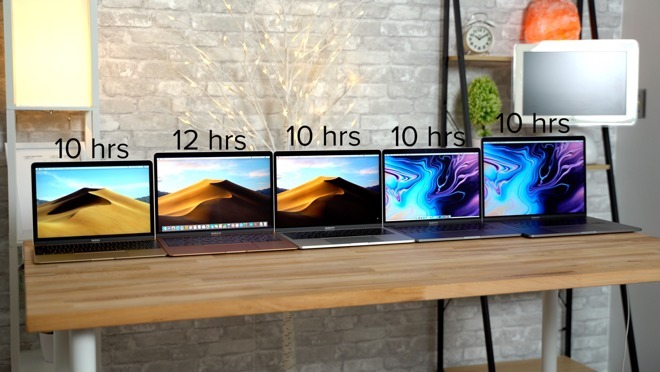 For battery life, the new MacBook Air is rated at 12 hours compared to 10 hours on the rest of the MacBooks, so if battery life is what you're after, the Air is the best option. And if you love using FaceTime, they're all packing HD webcams except for the 12" MacBook, which only gets a 480P FaceTime camera. Finally, let's talk about performance, starting with the processors. All but the Touch Bar MacBook Pro have dual-core processors. The 13-inch Touch Bar MacBook Pro has a quad-core processor and the 15-inch model has a six-core processor. 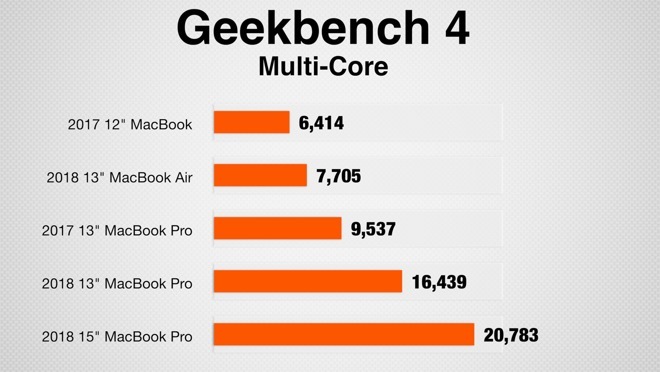 Looking at the quad- and six-core MacBook Pro's raw processing power with Geekbench 4 versus the dual-core models, there is no doubt that they are significantly faster than the dual-core models thanks to the extra cores. There is a small spike in performance with the 13-inch MacBook Pro with Function Keys versus the MacBook and MacBook Air. We also looked at performance per dollar using the full retail price of each MacBook, and the 2018 13-inch quad-core MacBook Pro comes out on top, with the 15-inch model trailing slightly behind. 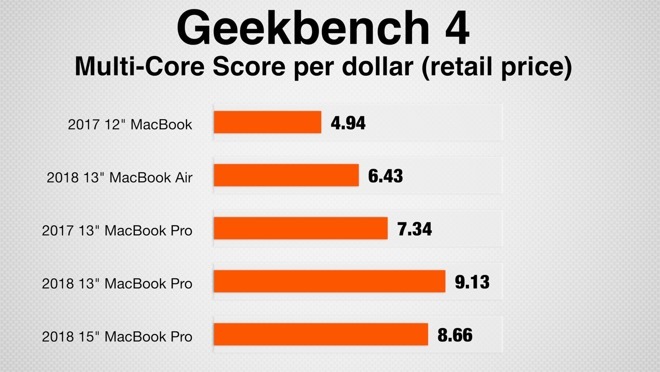 As expected, the 12-inch MacBook gives you extremely low performance per dollar, unsurprising, given that the model prioritizes portability over all other factors. 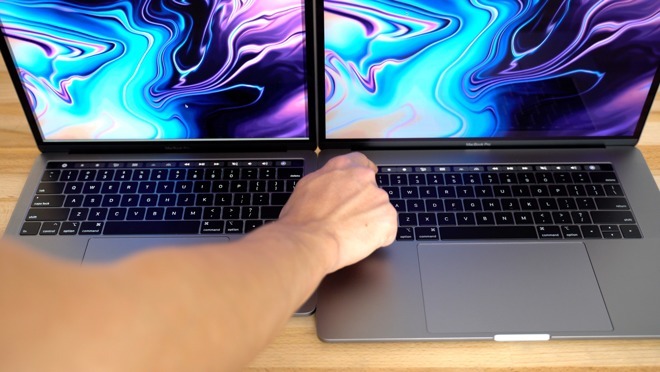 One thing to note is that the 12-inch MacBook is the only laptop in this comparison without a fan, so performance can take a bigger hit if it starts to heat up —but this varies a great deal on workload. 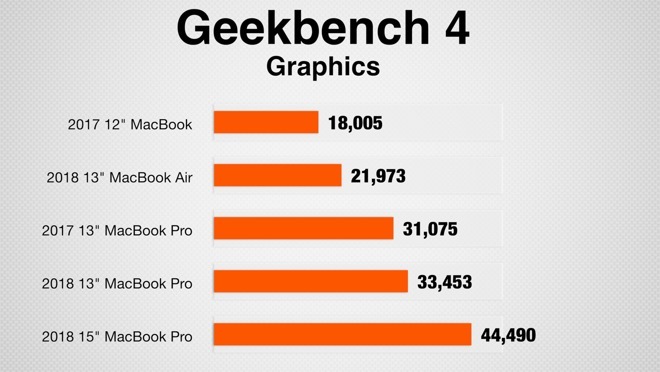 Now looking at raw graphics performance with Geekbench 4, the MacBook Pros have a huge advantage here. The 15-inch MacBook Pro is the clear leader in terms of performance, because it's the only model with a dedicated graphics chip. 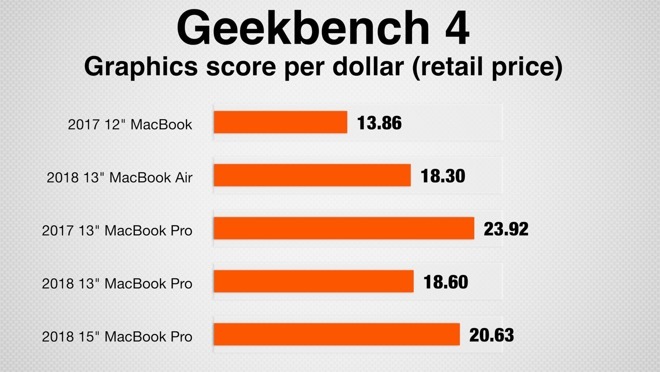 As for graphics performance per dollar, the 13-inch MacBook Pro with Function Keys wins out here because of low price, and the 15-inch MacBook Pro is right behind it. 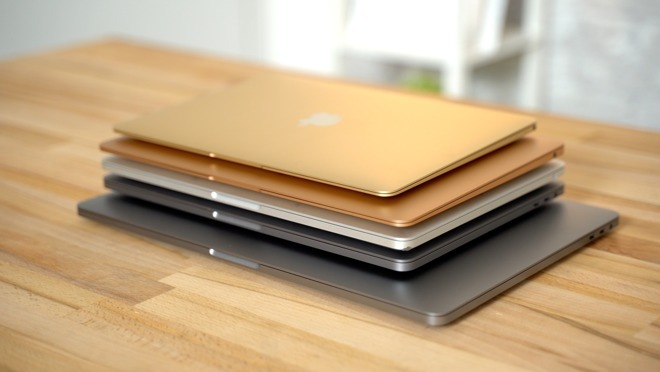 So if you're still confused on which MacBook you should buy, I'll break it down for you. If you want the thinnest, lightest MacBook you can get, and you don't really care about performance, ports, webcam quality, or having the best speakers, then buy the 12-inch MacBook. 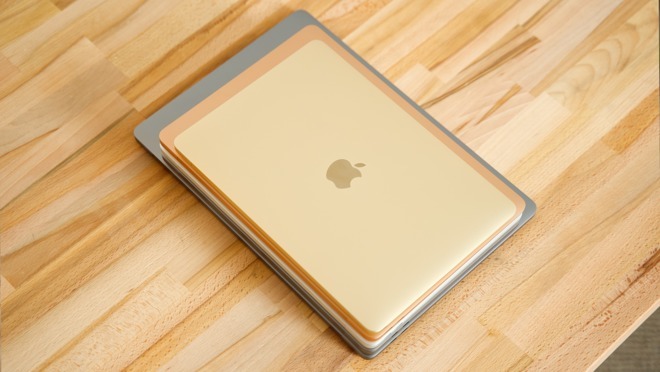 If you want the absolute best battery life, Touch ID and the third-generation keyboard, but you don't care that much about performance, display brightness, the smaller trackpad, or the slower power adapter, then go with new 13-inch MacBook Air. Extra performance, better speakers, and a very bright and color accurate display can be had with the 13-inch MacBook Pro with function Keys, assuming you don't care much for Touch ID, and you don't have the money to spend on the 2018 Touch Bar MacBook Pro. The best processor performance you can get for your dollar is in the 13-inch MacBook Pro with Touch Bar and its quad-core processor. You'll get four Thunderbolt 3 ports, the Touch Bar with Touch ID, the T2 security chip and the third-generation keyboard. 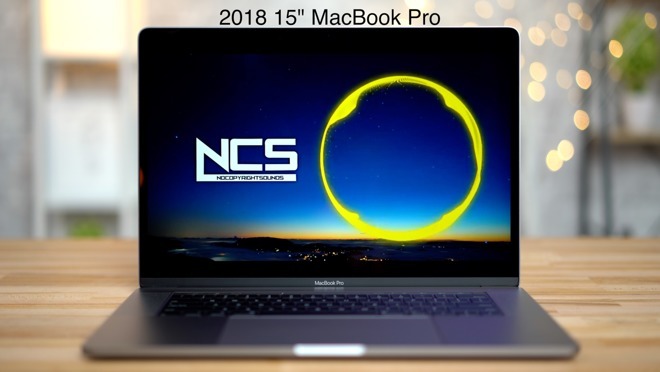 If you're someone who wants the absolute best, with the biggest trackpad, the best speakers, the biggest display, and the highest performance you can get with a powerful six-core processor and a dedicated graphics chip for intense rendering tasks, then definitely go for the 15-inch MacBook Pro. The holidays are quickly approaching and you're probably trying to figure out which Macbook to buy, whether it's for yourself, or as a gift. Everything Apple sells is on sale at some historically low prices, and often with an exclusive coupon code. To find the lowest prices on Apple's 12-inch MacBook, 13-inch MacBook Air or 2018 MacBook Pro, be sure to check out our Price Guides linked below. Updated throughout the day, the Price Guides display the best deals across multiple Apple authorized resellers leading up to Black Friday and throughout the holiday season —with discounts of up to $1,200 off.